Refining with anomalous data (or what phenix.refine does with Fobs+ and Fobs-). This document describes phenix.refine with the emphasis on the command line use. Graphical User Interface (GUI) is available for phenix.refine (see below). A complete graphical interface for phenix.refine is available; it includes integration with several refinement-related utilities such as phenix.ready_set, phenix.simple_ncs_from_pdb, and phenix.find_tls_groups. Essentially all of the program details described in this document should apply to the GUI as well. Use of knowledge-based restraints in phenix.refine to improve macromolecular refinement at low resolution. J.J. Headd, N. Echols, P.V. Afonine, R.W. Grosse-Kunstleve, V.B. Chen, N.W. Moriarty, D.C. Richardson, J.S. Richardson, and P.D. Adams. Acta Cryst. D68, 381-390 (2012). Automatic multiple-zone rigid-body refinement with a large convergence radius. P.V. Afonine, R.W. Grosse-Kunstleve, A. Urzhumtsev, and P.D. Adams. J Appl Crystallogr 42, 607-615 (2009). Although phenix.refine will read both data types, intensities or amplitudes, internally it uses amplitudes in nearly all calculations. Intensities are converted into amplitudes using French&Wilson method. Output of PDB file with refined model and ready to PDB deposition REMARK 3 records, MTZ file with Fourier map coefficients and other arrays, refinement log file containing comprehensive summary of refinement steps, model, data and model to data fit statistics. The program automatically generates a ".eff" file which contains all of the parameters for the job (for example if you provided lysozyme.pdb the file lysozyme_refine_001.eff will be generated). This is the set of input parameters for this run. The program automatically interprets the reflection file(s). If there is an unambiguous choice of data arrays these will be used for the refinement. If there is a choice, you're given a message telling you how to select the arrays. Several reflection files can be provided, for example: one containing Fobs and another one with R-free flags. Once the data arrays are chosen, the program writes all of the data it will be using in the refinement to a new MTZ file, for example, lysozyme_refine_data.mtz. This makes it very easy to keep track of what you actually used in the refinement (instead of having the arrays spread across multiple files). PDB file with the refined model called for example lysozyme_refine_001.pdb. This file contains REMARK records summarizing details about refinement run, as well as model, data and model-to-data fit statistics. Also, it contains REMARK 3 records that can be used for PDB deposition. Data actually used in refinement and calculation of reported statistics. These can be different from input data for a number of reasons: a) conversion Iobs to Fobs (if Iobs were input), b) truncation by resolution and/or sigma (if requested by the user), c) automated rejection of reflection-outliers. Fourier map coefficients that can be used for example in Coot or XtalView to visualize the maps. They correspond to 2mFobs-DFmodel map calculated using original set of Fobs, 2mFobs-DFmodel "filled" map, where missing Fobs are substituted with some expected values, residual mFobs-DFmodel map, and anomalous difference map (if input data was anomalous: contained Fobs(+) and Fobs(-) separately). log file that contains detailed information about refinement run. geo file is a foot print of all geometry restraints used in refinement, such as bonds, angles, planarity, chirality, dihedral, non-bonded. For each type of restraints current model and ideal (library) values are listed. This file allows to pinpoint all the restraints that an atom in question is involved. Optionally, actual maps can be output in CCP4 binary format or X-plor plain text format. Note that you don't have to specify the full parameter name. What you specify on the command line is matched against all known parameters names and the best substring match is used if it is unique. Otherwise a list of possible options is provided. The --overwrite option allows the program to overwrite existing files. By default the program will not overwrite existing files - just in case this would remove the results of a refinement job that took a long time to finish. The easiest way to create a file like the custom_par_2.params file is to generate a template file containing all parameters by using the command phenix.refine --show-defaults=all and then keep the parameters that you want to use and remove the rest. In this example the only parameter that is used to overwrite the defaults is target_weights.wxc_scale and the rest is commented out. Below are examples to illustrate the use of the strategy keyword as well as a few others. This will perform coordinate refinement, restrained ADP refinement and occupancy refinement (if applicable, see Occupancy refinement section for details). Three macrocycles will be executed, each consisting of bulk solvent correction, anisotropic scaling of the data, coordinate refinement (25 iterations of the LBFGS minimizer) and ADP refinement (25 iterations of the LBFGS minimizer). group-constrained refinement in torsion angle space using SA (often called torsion angle simulated annealing refinement). The default restrained refinement includes a standard set of stereo-chemical restraints (covalent bonds, angles, dihedrals, planarities, chiralities, non-bonded). The NCS restrains can be added as well. Completely unrestrained refinement is possible. where: Exray is crystallographic refinement target (least-squares, maximum-likelihood, or any other), Egeom is the sum of restraints (including NCS if requested), wc is 1.0 by default and used to turn the restraints off, wxc ~ ratio of gradient norms for geometry and X-ray targets as defined in (Adams et al, 1997, PNAS, Vol. 94, p. 5018), wxc_scale is an empirical scale that is typically between 0 and 10. Egeom can optionally include reference model, secondary structure and Ramachandran plot restraints. By default coordinates of all atoms are refined. It is possible to refine coordinates of only selected atoms. Using strategy=rigid_body or strategy=individual_sites will ask phenix.refine to refine only coordinates while other parameters (ADP, occupancies) will be fixed (not refined). phenix.refine will stop if an atom on special position is included into group of atoms that are subject to rigid body refinement. The solution is to make a new rigid body group selection containing no atoms on special positions. phenix.refine implementation of rigid body refinement is highly and efficient (large convergence radius, no need to cut high-resolution data). We call this MZ protocol (multiple zones). The essence of MZ protocol is that the refinement starts with a few reflections selected in the lowest resolution zone and proceeds with gradually adding higher resolution reflections. Also, it almost constantly updates the mask and bulk solvent model parameters and this is crucial since the bulk solvent affects the low resolution reflections - exactly those the most important for success of rigid body refinement. The default set of the rigid body parameters is good for most of the cases and is normally not supposed to be changed. Rigid body refinement does not use any restraints. This means that rigid-body groups may bump into each other (overlap) or if covalently bonded atoms belong to different rigid groups then the bond linking these atoms may (and likely will) break as result of rigid body refinement. This will refine the chain A and chain B as two rigid bodies. The rest of the model will be kept fixed. Files like this can be created, for example, by copy-and-paste from the complete list of parameters (phenix.refine --show-defaults=all). For such refinement to be useful one needs to cut the high-resolution data off at some arbitrary point around 3-5 A (depending on model size and data quality). Decreasing this number may increase the convergence radius of rigid body refinement but small numbers may lead to refinement instability and nonsensical model shifts. Increasing this number may increase the convergence radius of rigid body refinement at the cost of much longer run time. this will do the same refinement as above combined with the Simulated Annealing refinement at the second macro-cycle. This will perform Simulated Annealing refinement and LBFGS minimization for the whole model. SA will run on select macro-cycle(s) only (not every macro-cycle). Other options may exist: check all parameters for details. This will refine the coordinates of atoms in chain A only. This assigns the contribution of the geometry restraints target to zero. However, it is still calculated for statistics output. the following restraints will be removed: angle for all atoms in chain B, dihedral for all involving CA atoms, all chirality. All planarity restraints will be preserved. Local refinement: amino-acid side-chain rotamer correction to eliminate outliers and find better fit to the map. Enabled by default, and controlled by strategy=individual_sites_real_space keyword. Overall (global) real-space refinement only happens at low resolution if the program decided to do so. Results of global real-space refinement may or may not be accepted by the program, which is based on comparison of R factors before and after refinement. where Utotal is the total ADP, Ulocal reflects the local atomic vibration (also named as residual B) and Ucryst reflects global lattice vibrations. Ucryst is determined and refined as part of overall anisotropic scaling. TLS and grouped B refinement for chain F.
Restraints are used for default ADP refinement of isotropic and anisotropic atoms. Completely unrestrained refinement is possible. where: Exray is crystallographic refinement target (least-squares, maximum-likelihood, ...), Eadp is the ADP restraints term, wu is 1.0 by default and used to turn the restraints off, wxu and wxu_scale are defined similarly to coordinates refinement (see Refinement of Coordinates paragraph). Atoms that participate in TLS refinement have ANISOU records in output PDB file. The anisotropic B-factor in ANISOU records is the total B-factor (Utls + Ulocal). The isotropic equivalent B-factor in ATOM records is the mean of the trace of the ANISOU matrix divided by 10000 and multiplied by 8*pi^2. It represents the isotropic equivalent of the total B-factor. To obtain the individual B-factors (Ulocal), one needs to compute the TLS component (Utls) using the TLS records in PDB file header and then subtract it from the total B-factors. This can be done using phenix.tls tool. When performing TLS refinement along with individual isotropic refinement the restraints are applied to Ulocal only and not to the total ADP. Group isotropic ADP or TLS refinement do not use any restraints. When ADP refinement is run without using selections then ADP of all atoms are refined. If selections are used, only ADP of selected atoms are refined. phenix.refine will stop if an atom on special position is included in TLS group. The solution is to make a new TLS group selection containing no atoms on special positions. This only applies to amino acid residues. This will refine one isotropic B for chain A and one B for chain B.
Refinement of group isotropic B-factors in phenix.refine does not change the original distribution of B-factors within the group: the differences between B-factors for atoms within the group remain constant. Example: if 10,15,25 are B-factors of atoms subject to group B-factor refinement, then after refinement they may have B-factors such as 5,10,20 or 13,18,28. Atoms with anisotropic ADP are allowed to be within the group; anisotropy of such atoms will not be changes during group B-factor refinement. By default atoms in a PDB file with ANISOU records are refined as anisotropic and atoms without ANISOU records are refined as isotropic. This behavior can be changed with appropriate keywords, and also a subject to automatic adjustments. If atoms have ANISOU records and are not a part of TLS group, and also the data resolution is lower than switch_to_isotropic_high_res_limit parameter, then ADPs of such atoms are reset to isotropic and will be refined as such. Note, atoms in input PDB file with ANISOU records will be refined as anisotropic and those without ANISOU - as isotropic (subject to automatic adjustments - see above). All anisotropic atoms in input PDB file will be converted to isotropic before the refinement starts. This will refine all atoms as anisotropic except hydrogens. adp.individual.isotropic="chain B or element H"
Shortcuts can be used: adp.individual.aniso or adp.individual.iso. This assigns the contribution of the ADP restraints target to zero. However, it is still calculated for statistics output. When selections adp.individual.aniso or adp.individual.iso are used, B-factors of selected atoms are refined, while B-factors of other atoms are not refined. Alternatively, the selection for the TLS groups can be made from the command line (see rigid body refinement for an example). Note: TLS parameters will be refined only for selected fragments. This, for example, will allow to not include the solvent molecules into the TLS groups. This will allow to model global (TLS) and local (individual) components of the total ADP and also compensate for the model parts where TLS parametrization doesn't suite well. Very important: automatic TLS group identication strongly relies on correctly refined B-factors and relatively good model geometry. Poor B-factors or model geometry may result in nonsensical TLS groups. individual occupancy refinement - refinement of one occupancy per atom. In this case the refined occupancy value will be constrained between main.occupancy_min and main.occupancy_max, which is 0 and 1 by default. refine one occupancy per selected set of atoms, such as a partially occupied ligand or ion. The refined occupancy will be constrained between 0 and 1.
refine occupancies of atoms in alternative conformations. For example, if a residue has two alternative conformations, A and B, then there will be one refinable occupancy parameter. All occupancies within the conformer A will be equal to each other, and the same will be for conformer B. The sum of occupancies of A and B will add up to one. In general, for a constrained group containing N coupled conformers (for example, N=2 for alternative conformations A and B) there will be (N-1) refinable occupancies. There is no limit on the number of constrained groups (N can be any). Starting occupancy values can be any. Setting them to some reasonable values, like 0.75 and 0.25 above, may help refinement to converge faster. Refined occupancy values will be looking like in the above example: identical for all atoms within each conformer (in this example: 0.75 for conformer A and 0.25 for conformer B), and the sum of unique occupancies across all conformers will be exactly 1 (=0.25+0.75). where the occupancies of conformer A (in residue numbers 1 and 2) are all equal to each other (0.7), the occupancies of conformer B are all equal to each other as well (0.3), and their sum is 1 (0.7+0.3). all occupancies will be refined individually except for atom O2 where it will stay zero. This situation is detected automatically and the occupancies of H and D atoms are refined in such a way so their sum is one. In addition, B-factors and coordinates of such atoms are set to be identical. Disabling occupancy refinement can be done by removing the star (*) from the corresponding keyword in strategy = ... *occupancies ... (in case parameter file is used). If selections are provided by the user then the occupancy refinement for selected atoms will be performed as well as for those selected automatically. User defined selections will override those defined by phenix.refine automatically. User can withhold occupancy refinement for atoms that were automatically selected by phenix.refine for occupancy refinement. The presence of user defined selections for occupancies to be refined is not enough to engage the occupancy refinement. It is important that the occupancy refinement is enabled by using the strategy = keyword. This will refine individual coordinates, individual B-factors (isotropic or anisotropic) and occupancies for atoms in alternative conformations or for atoms having partial occupancies. If there is no such atoms in input PDB file, then no occupancies will be refined. This will only refine occupancies for atoms in alternative conformations or for atoms having partial occupancies. If there is no such atoms in input PDB file, then no occupancies will be refined. Other model parameters, such as B-factors or coordinates will not be refined. % phenix.refine data.hkl model.pdb refine.occupancies.individual="water"
occupancies.individual="chain X and element Zn"
group occupancy refinement for residue number 1 in chain A (as selected with chain A and resseq 1). One occupancy for all atoms in this residue will be refined and it will be constrained between main.occupancy_min and main.occupancy_min, which by default is 0 and 1, correspondingly. another constrained occupancy group, where the occupancies of atoms in chain A and resseq 2 and chain A and resseq 3 will be coupled. That is all occupancies within chain A and resseq 2 will have the exact same value between 0 and 1, and same for chain A and resseq 3. The sum of occupancies of chain A and resseq 2 and chain A and resseq 3 will be 1.0, making it one constrained group. another constrained group contains three residues (number 42 and 121, and MAN) and their occupancies will be refined similarly as described above. occupancies of atoms O in residues 1 and 3 of chain B will not be refined as requested using remove_selection keyword (even though these atoms have partial occupancies in input PDB file and so they would normally be refined by default). Here f' is fixed at -5 (note the missing * in front of f_prime in the refine definition), and the refinement of f" is initialized at 2. Note that if you perform anomalous refinement, you may also want to include a log-likelihood gradient anomalous map (map_type=llg) in the output, as this will show any unmodeled anomalous scattering with greater sensitivity than the conventional anomalous difference map. phenix.refine can use NCS as restraints or constraints. NCS restraints can be torsion- or Cartesian-based. NCS-related atoms can be identified automatically or be defined by the user. The default NCS implementation in phenix.refine restrains NCS-related chains in torsion angle space. Hydrogen atoms are excluded from NCS restraints. Note that user-supplied NCS groups will be filtered at all times. More on this here. Torsion-based NCS restraints use a flexible target function that is smoothly shuts off as the difference between related torsions increases, allowing for local differences between NCS-related chains. The default behavior identifies related chains automatically, but users may also specify NCS groups. Automatic rotamer outlier correction and rotamer consistency checks between NCS-related sidechains are carried out for refinements against data at 3.0 A and better. No NCS restraints applied to B-factors. Cartesian-based NCS restraints are also available in phenix.refine. Atoms in NCS-related chains are restrained to the average xyz position. Gaps in selected sequences are allowed - a sequence alignment is performed to detect insertions or deletions. We recommend to check the automatically detected or adjusted NCS groups. This will perform the default refinement round (individual coordinates and B-factors) using NCS restraints on coordinates and B-factors. Note: user specified NCS restraints in ncs_groups may be modified automatically if specified groups are not match each other. This will perform the default refinement round (individual coordinates and B-factors) using NCS restraints automatically created based on input PDB file. Please read an overview about secondary structure restraints which provides overall description and ways to get correct secondary structure definitions. This part of documentation provides only specific to phenix.refine information. This will print a set of parameters suitable for use in phenix.refine, which may be edited to correct errors or add undetected groups. phenix.refine can be given a reference model that is used to steer refinement of the working model. This technique is advantageous in cases where the working data set is low resolution, but there is a known related structure solved at higher resolution. The higher resolution reference model is used to generate a set of dihedral restraints that are applied to each matching dihedral in the working model. Reference chains are matched to working chains automatically, and sequences need not match exactly. Selections may also be used with reference_model restraints. Selections are useful in cases where multiple chains in the working model should be restrained to the same reference chain, the model or reference have insertions that change the register, only part of a chain is desirable to restrain, etc. Note that reference will be applied to reference model and selection will be applied to refined model. Each selection (both reference and selection entries as above) may only specify one chainID and/or one resseq range. Note that even though file_name parameter is provided in both reference groups, refinement.reference_model.file should still contain both file names. The refinement.reference_model.reference_group.file_name parameter is only required when more than one reference file is used. This parameter allows the reference model restraint generation to disambiguate between reference files that contain chains with the same chainID. Asn, Gln, and His residues can often be fit favorably to the data in two orientations, related by a 180 degree rotation. In many cases, however, only one of these orientations is sterically and electrostatically favorable. phenix.refine uses Reduce to identify Asn, Gln, and His residues that should be flipped, and then flips them automatically. This feature is enabled by default. phenix.refine can add, remove and refine waters as part of a refinement run. This is the recommended procedure for adding water structure. This will add new water, analyse existing waters (and delete bad ones if necessary) and refine individual coordinates and B-factors of both, macromolecule and water. Perform water update every macro-cycle. This will skip water picking if the resolution of data is lower than 2.8A, it will remove waters with B < 1.0 or B > 50.0 A**2 or occupancy different from 1 or peak height at mFo-DFc map lower then 3 sigma. It will not select or will remove existing water if water-water or water-macromolecule distance is less than 1.8A or water-macromolecule distance is greater than 6.0 A. The initial occupancies and B-factors of newly placed waters will be 1.0 and 25.0 correspondingly. If b_iso = None, then b_iso will be the mean atomic B-factor. complete refinement of H (H atoms will be refined as other atoms in the model). Using the riding model does not add additional refinable parameters, since position of a hydrogen atom H in X-H bond is recalculated from the current position of atom X. Also, H atom inherits the occupancy of X atom and its B-factor. Sometime the B-factor of H atom is the product of B-factor of X atoms and a scale from 1 to 1.5. The riding model should be used to parametrize H atoms at almost all resolutions in X-ray refinement. An exception can be a subatomic resolution ( ~0.7A and higher), where the hydrogen's parameters can be refined individually. Although the contribution of hydrogen atoms to X-ray scattering is weak, H atoms are present in real structures irrespective of the data quality. Including them as riding model at any resolution makes other model atoms aware of their positions resulting in better refined model parameters. If neutron data is used then the parameters of H atoms should always be refined individually, except the cases where data resolution and/or completeness are poor. In that case riding model can be used. If partially deuterated structure is used in refinement then the constrained occupancies of exchangeable H/D sites are refined so they add up to 1.
phenix.refine does not add H atoms (except a few cases mentioned below). To use hydrogen atoms in refinement thet need to be added to the model first. This can be done by using phenix.ready_set program, which can add H, D or H/D atoms. Internally phenix.ready_set uses Reduce to add H to macromolecule (protein, DNA/RNA) and it uses its own resources to add hydrogens to ligands or water. Hydrogens are added to their ideal geometrical positions. Different dictionary X-H lengths can be used for X-ray and neutron data. If a structure contains a ligand unknown to phenix.refine, ReadySet! will create a library CIF file which will include the definitions for all newly added hydrogens. H atoms are automatically excluded from TLS groups and NCS restraints. However, if NCS selections are created manually and the structure contains H atoms, it might be a good idea to add and not (element H or element D) to all selection strings. % phenix.pdbtools model.pdb remove="element H or element D"
We strongly recommend to not remove hydrogen atoms after refinement since it will make the refinement statistics (R-factors, etc...) unreproducible without repeating exactly the same refinement protocol. Output PDB file called model_h.pdb will contain the original ligand MAN with all hydrogen atoms added. % phenix.refine data.hkl model.pdb twin_law="-k,-h,-l"
The twin law (in this case -k,-h,-l) can be obtained from phenix.xtriage. If more than a single twin law is possible for the given unit cell and space group, using phenix.twin_map_utils might give clues which twin law is the most likely candidate to be used in refinement. The detwinning mode is auto by default: it will perform algebraic detwinning for twin fraction below 40%, and detwinning using proportionality rules (SHELXL style) for fractions above 40%. An important point to stress is that phenix.refine will only deal properly with twinning that involves two twin domains. Refinement using neutron data requires having H or/and D atoms added to the model. Use ReadySet! program to add all H, D or H/D atoms. See "Hydrogens in refinement" section for details. this will tell phenix.refine that the data in data.hkl file is coming from neutron scattering experiment and the appropriate scattering factors will be used in all calculations. All the examples and phenix.refine functionality presented in this document are valid and compatible with using neutron data. Using X-ray and neutron data simultaneously (joint X/N refinement). phenix.refine allows simultaneous use of both data sets, X-ray and neutron. The data sets are allowed to have different number of reflections and be collected at different resolutions. where optimize_xyz_weight will turn on the optimization of X-ray/stereochemistry weight and optimize_adp_weight will turn on the optimization of X-ray/ADP weight. Note that this could be very slow since the procedure involves a grid search over an array of weights-candidates. It could be a good idea to run this overnight for a final model tune up. By default, phenix.refine will refine positions of H atoms as riding model (H atom will exactly follow the atom it is attached to). Note that phenix.refine can also refine individual coordinates of H atoms (can be used for small molecules at ultra-high resolutions or for refinement against neutron data). This is governed by hydrogens.refine = individual *riding keyword and the default is to use riding model. hydrogens.refine defines how hydrogens' B-factors are refined (default is to refine one group B for all H atoms). At high resolution one should definitely try to use one_b_per_molecule or even individual choice (resolution permitting). Similar strategy should be used for refinement of H's occupancies, hydrogens.refine_occupancies keyword. most of the atoms should be refined with anisotropic ADP. Exceptions could be model parts with high B-factors), atoms in alternative conformations, hydrogens and solvent molecules. However, at resolutions higher than 1.0A it's worth of trying to refine solvent with anisotropic ADP. it is a good idea to constantly monitor the existing solvent molecules and check for new ones by using ordered_solvent=true keyword. If it's decided to refine waters with anisotropic ADP then make sure that the newly added ones are also anisotropic; use ordered_solvent.new_solvent=anisotropic (default is isotropic). One can also ask phenix.refine to refine occupancies of water: ordered_solvent.refine_occupancies=true (default is False). at high resolution the alternative conformations can be visible for more than 20% of residues. phenix.refine automatically recognizes atoms in alternative conformations (based on PDB records) and by default does constrained refinement of occupancies for these atoms. Please note, that phenix.refine does not build or create the fragments in alternative conformations; the atoms in alternative conformations should be properly defined in input PDB file (using conformer identifiers) (if actually found in a structure). the default weights for stereochemical and ADP restraints are most likely too tight at this resolution, so most likely the corresponding values need to be relaxed. Use wxc_scale and wxu_scale for this; higher values, like 1, 1.5, 2, ... etc should be tried. phenix.refine allows automatically optimize these values ( optimize_xyz_weight=True and optimize_adp_weight=True), however this is a very slow task so it may be considered for an over night run or even longer. At ultra-high resolutions (approx. 0.8A or higher) a complete unrestrained refinement should be definitely tried out for well ordered parts of the model (single conformations, low B-factors). at ultra-high resolution the residual maps show the electron density redistribution due to bonds formation as density peaks at interatomic bonds. phenix.refine has specific tools to model this density called IAS models (Afonine et al, Acta Cryst. (2007). D63, 1194-1197). In the example above phenix.refine will perform 5 macro-cycles with ordered solvent update (add/remove) every macro-cycles, all atoms including newly added water will be refined with anisotropic B-factors (except hydrogens), riding model will be used for positional refinement of H atoms, one occupancy and isotropic B-factor will be refined per all hydrogens within a residue, occupancies of waters will be refined as well, the default stereochemistry and ADP restraints weights are scaled down by the factors of 0.25 and 0.3 respectively. If starting model is far enough from the "final" one, more macro-cycles may be required (than 5 used in this example). where tls_groups_selections.txt, rigid_body_groups_selections.txt are the files TLS and rigid body groups selections, NCS will be determined automatically from input PDB file. See this document for details on how specify these selections. Note: in these four examples above we re-defined the default number of refinement macro-cycles from 3 to 10, since a start model with high R-factors most likely requires more cycles to become a good one. Also in these examples, the rigid body refinement will be run only once at first macro-cycle, the water picking will start after half of macro-cycles is done (after 5th), the SA will be done only twice - the first and before the last macro-cycles. Even though it is requested, the water picking may not be performed if the resolution is too low. All these default behaviors can be changed: see parameter's help for more details. Refinement at "higher than medium" resolution - getting anisotropic. At resolutions around 1.8 ... 1.7 A or higher it is a good idea to try refinement of anisotropic ADP for atoms at well ordered parts of the model. Well ordered parts can be identified by relatively small isotropic B-factors ~5-20A**2 of so. The riding model for H atoms should be used. Loosing stereochemistry and ADP restraints. Re-thing using the NCS (if present): it may turn out to be enough of data to not use NCS restrains. Try both, with and without NCS, and based on R-free vales decide the strategy. In the command above phenix.refine will refine the ADP of atoms in residues from 1 to 2 as anisotropic, the rest (including all H atoms) will be isotropic, the X-ray target contribution is increased for both, coordinate and ADP refinement. IMPORTANT: Please make note of the selection used in the above command: selecting atoms in residues 1 and 2 to be refined as anisotropic, one need to exclude hydrogens, which should be refined as isotropic. Stereochemistry looks too tightly / loosely restrained, or gap between R-free and R-work seems too big: playing with restraints contribution. The default value for wxu_scale is 1.0. Increasing wxu_scale will make the X-ray target contribution greater and therefore the B-factors restraints weaker. Having unknown to phenix.refine item in PDB file (novel ligand, etc...). phenix.refine uses the CCP4 Monomer Library as the source of stereochemical information for building geometry restraints and reporting statistics. Consult eLBOW documentation for more details. When used with the default settings, nproc will have a minimal effect on overall runtime, but when the optimization grid searches are enabled, a speedup of 4-5x is possible. Values of nproc above 18 are unlikely to yield further speed improvement. It is important to understand that reflections selected for test set must be never used in any refinement of any parameters. If the newly selected test reflections were used in refinement before then the corresponding R-free statistics will be wrong. In such case "refinement memory" removal procedure must be applied to recover proper statistics. This will perform the grid search for solvent_radius and shrink_truncation_radius and select the values giving the best R-factor. By default phenix.refine adds isotropic component of overall anisotropic scale matrix to atomic B-factors, leaving the trace of overall anisotropic scale matrix equals to zero. This is the reason why one can observe the ADP changed even though the only anisotropic scaling was done and no ADP refinement performed. % phenix.refine data.hkl model.pdb sites.rotate="1 2 3" sites.translate="4 5 6"
When converting atoms into anisotropic, it is important to make sure that hydrogens (if present in the model) are not converted into anisotropic. % phenix.refine data.hkl model.pdb adp.set_b_iso=25 modify_start_model.selection="chain A"
Documentation on phenix.pdbtools is also available. Note: 1) the corresponding statistics (R-factors, ...) will be identical for "work" and "test" sets; 2) it is still necessary to have test flags presented in input reflection file (or automatically generated by phenix.refine). The number of calculated structure factors will the same as the number of observed data (Fobs) provided in the input reflection files or less since resolution and sigma cutoffs may be applied to Fobs or some Fobs may be automatically removed by outliers detection procedure. The set of calculated structure factors has the same completeness as the set of provided Fobs. The only output will be: .log and .pdb files. The results of certain refinement protocols, such as restrained refinement of coordinates (with SA or LBFGS minimization), are sensitive to the random seed. This is because: 1) for SA the refinement starts with random assignment of velocities to atoms; 2) the X-ray/geometry target weight calculation involves model shaking with some Cartesian dynamics. As result, running such refinement jobs with exactly the same parameters but different random seeds will produce different refinement statistics. The author's experience includes the case where the difference in R-factors was about 2.0% between two SA runs. Also, this opens a possibility to perform multi-start SA refinement to create an ensemble of slightly different models in average but sometimes containing significant variations in certain parts. This will output one file with map coefficients for 2mFo-DFc, mFo-DFc and 3Fo-2Fc maps, and one X-plor formatted file containing 2mFo-DFc map computed around residue 1 in chain A. The map finesse will be (data resolution)*grid_resolution_factor. If atom_selection is set to None or all then map will be computed for all atoms. The way phenix.refine uses Fobs+ and Fobs- is controlled by xray_data.force_anomalous_flag_to_be_equal_to parameter. Look this documentation to see how to use and refine f' and f''. By default, both sigma_fobs_rejection_criterion and sigma_iobs_rejection_criterion are set to zero (no reflections rejected) and, unless strongly motivated, we encourage to not change these values. If amplitudes provided at input then sigma_fobs_rejection_criterion is ignored. phenix.refine offers a broad functionality for experimenting that may not be useful in everyday practice but handy for testing ideas. Instead of using Fobs from input data file one can ask phenix.refine to use the calculated structure factors Fcalc using the input model. Obviously, the R-factors will be zero throughout the refinement. One can also shake various model parameters (see this document for details), then refinement will start with some bad statistics (big R-factors at least) and hopefully will converge to unmodified start model (if not shaken too well). In this example, the input Fobs will be substituted with the same amount of Fcalc (absolute values of Fcalc), then the coordinates of the structure will be shaken to achieve rmsd=0.5 and finally the default run of refinement will be done. The bulk solvent and anisotropic scale and overall scalar scales are also added to thus obtained Fcalc in accordance with Fmodel definition (see this document for definition of total structure factor, Fmodel). Expected refinement behavior: R-factors will drop from something big to zero. phenix.refine has an automatic option for generating links within the same chain. It will look for carbohydrate links, both within the sugar polymer and linking to the protein. Covalent bonded ligands can also be linked with this option. There are a number of parameters that allow the tailoring of the various bond class cutoffs. There are also options within the automatic_linking scope for various bond length cutoffs. All apply_cif_modification and apply_cif_link definitions will be included into the .def files. I.e. it is not necessary to specify the definitions again if further refinement runs are started with .def files. Note that all LINK, SSBOND, HYDBND, SLTBRG and CISPEP records in the input PDB files are ignored. The edits will be included into the .def files. I.e. it is not necessary to manually specify them again if further refinement runs are started with .def files. This will produce a potentially long all_distances file, but if you search for sym= there will probably only be a few matches from which it is easy to pick the one you are interested in, based on the pdb atom labels. The slack value must be greater than or equal to zero (it can also be None, which is equivalent to zero in this case). phenix.refine reports a comprehensive statistics in PDB file header of refined model. This statistics consists of two parts: the first (upper, formatted with REMARK record) part is relevant to the current refinement run and contains the information about input data and model files, time stamp, start and final R-factors, refinement statistics from macro-cycle to macro-cycle, etc. The second (lower, formatted with REMARK 3 record) part is abstracted from a particular refinement run (no intermediate statistics, time, no file names, etc.). This part is supposed to go in PDB and the first part should be removed manually. file_name = None This is normally the same as the file containing Fobs and is usually selected automatically. test_flag_value = None This value is usually selected automatically - do not change unless you really know what you're doing! ignore_pdb_hexdigest = False If True, disables safety check based on MD5 hexdigests stored in PDB files produced by previous runs. use_dataman_shells = False Used to avoid biasing of the test set by certain types of non-crystallographic symmetry. file_name = None Sequence data in a text file (supported formats include FASTA, PIR, and raw text). Currently this is only used by the PHENIX GUI for validation. pickle_fmodel = False Dump final fmodel object into a pickle file. pickle_stats_by_cycle = False Dump monitored refinement statistics into a pickle file. n_resolution_bins = None Sets the number of bins used for resolution-dependent statistics in output files and the Phenix GUI. If None, the binning will be determined automatically. 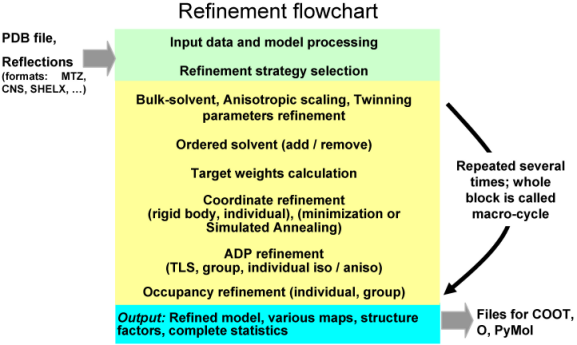 group_adp_refinement_mode = *one_adp_group_per_residue two_adp_groups_per_residue group_selection Select one of three available modes for group B-factors refinement. For two groups per residue, the groups will be main-chain and side-chain atoms. Provide selections for groups if group_selection is chosen. individual = None Selection(s) for individual atoms. None is default which is to refine the individual occupancies for atoms in alternative conformations or for atoms with partial occupancies only. remove_selection = None Occupancies of selected atoms will not be refined (even though they might satisfy the default criteria for occupancy refinement). constrained_groupSelections to define constrained occupancies. If only one selection is provided then one occupancy factor per selected atoms will be refined and it will be constrained between predefined max and min values. selection = None Atom selection string. place_ions = None If enabled, Phenix will attempt to replace specific solvent atoms with elemental ions. A value of Auto will search for Mg, Ca, Zn, and Cl using relatively restrictive rules, but an explicit list of elements is recommended. See associated ion_placement parameters for more options. use_experimental_phases = None Use experimental phases if available. If true, the target function must be set to mlhl , and a file containing Hendrickson-Lattman coefficients must be supplied. wavelength = None X-ray wavelength, currently used only when ion placement is enabled (and anomalous data are supplied). show_residual_map_peaks_and_holes = False Show highest peaks and deepest holes in residual_map. 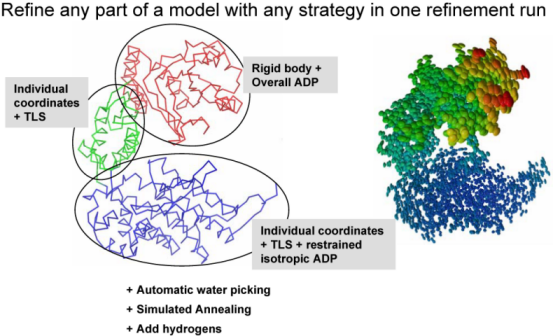 switch_to_isotropic_high_res_limit = 1.5 If the resolution is lower than this limit, all atoms selected for individual ADP refinement and not participating in TLS groups will be automatically converted to isotropic, whether or not ANISOU records are present in the input PDB file. find_and_add_hydrogens = False Find H or D atoms using difference map and add them to the model. This option should be used if ultra-high resolution data is available or when refining againts neutron data. nproc = 1 Determines number of processor cores to use in parallel routines. Currently, this only applies to automatic TLS group identification. file_name = None Default is the original file name with the file extension replaced by _modified.pdb . grid_step_factor = 4.0 The grid step for the mask calculation is determined as highest_resolution divided by grid_step_factor. This is considered as suggested value and may be adjusted internally based on the resolution. mean_shift_for_mask_update = 0.001 Value of overall model shift in refinement to updates the mask. use_sigma_scaled_maps = True Default is sigma scaled map, map in absolute scale is used otherwise. run_finite_differences_test = False Test with finite differences instead of gradients. FOR DEVELOPMENT PURPOSES ONLY. eps = 1.e-6 Finite difference setting. constrain_correlated_3d_groups = False DEVELOPER OPTION: constrain occupancies for correlated alternate conformations. target_auto_switch_resolution = 6.0 Used if target=auto, use optimal target for given working resolution. disable_final_r_factor_check = False If True, the R-factor check after refinement will not revert to the previous model, even if the R-factors have increased. refine_rotation = True Only rotation is refined (translation is fixed). refine_translation = True Only translation is refined (rotation is fixed). bulk_solvent_and_scale = True Bulk-solvent and scaling within rigid body refinement (needed since large rigid body shifts invalidate the mask). min_number_of_reflections = 200 Number of reflections that defines the first lowest resolution zone for the multiple_zones protocol. If very large displacements are expected, decreasing this parameter to 100 may lead to a larger convergence radius. exclusion_distance_cutoff = 3 If SG of CYS forming SS bond is closer than this distance to an atom that it may coordinate then this SG is excluded from SS bond. nonbonded_weight = None Weighting of nonbonded restraints term. By default, this will be set to 16 if explicit hydrogens are used (this was the default in earlier versions of Phenix), or 100 if hydrogens are missing. ss_by_chain = True Find secondary structure only within individual chains. Alternative is to allow H-bonds between chains. Can be much slower with ss_by_chain=False. If your model is complete use ss_by_chain=True. If your model is many fragments, use ss_by_chain=False. use_representative_chains = True Use a representative of all chains with the same sequence. Alternative is to examine each chain individually. Can be much slower with use_representative_of_chain=False if there are many symmetry copies. Ignored unless ss_by_chain is True. search_method = *ksdssp mmtbx_dssp from_ca cablam Particular method to search protein secondary structure. helix_type = *alpha pi 3_10 unknown Type of helix, defaults to alpha. Only alpha, pi, and 3_10 helices are used for hydrogen-bond restraints. angle_between_bond_and_nucleobase_cutoff = 35.0 If angle between supposed hydrogen bond and basepair plane (defined by C4, C5, C6 atoms) is less than this value (in degrees), the bond will not be established. scale_bonds_sigma = 1. All sigmas for h-bond length will be multiplied by this number. The smaller number is tighter restraints. reference_coordinate_restraintsRestrains coordinates in Cartesian space to stay near their starting positions. This is intended for use in generating simulated annealing omit maps, to prevent refined atoms from collapsing in on the region missing atoms. For conserving geometry quality at low resolution, the more flexible reference model restraints should be used instead. link_all = False If True, bond restraints will be generated for any appropriate ligand-protein or ligand-nucleic acid covalent bonds. This includes sugars, amino acid modifications, and other prosthetic groups. ramachandran_restraints = False Restrains peptide backbone to fall within allowed regions of Ramachandran plot. Although it does not eliminate outliers, it can significantly improve the percent favored and percent outliers at low resolution. Probably not useful (and maybe even harmful) at resolutions much higher than 3.5A. rama_selection = None Selection of part of the model for which Ramachandran restraints will be set up. restrain_allowed_outliers_with_emsley = False In case of restrain_rama_outliers=True and/or restrain_rama_allowed=True still restrain these residues with emsley. Make sense only in case of using oldfield potential. ncs_groupThe definition of one NCS group. Note, that almost always in refinement programs they will be checked and filtered if needed. ncs_searchSet of parameters for NCS search procedure. Some of them also used for filtering user-supplied ncs_group. enabled = False Enable NCS restraints or constraints in refinement (in some cases may be switched on inside refinement program). exclude_selection = "element H or element D or water" Atoms selected by this selection will be excluded from the model before any NCS search and/or filtering procedures. There is no way atoms defined by this selection will be in NCS. try_shortcuts = False Try very quick check to speed up the search when chains are identical. If failed, regular search will be performed automatically. primary_map_type = mFobs-DFmodel Map used to identify candidate water sites - by default this is the standard difference map. refine_adp = True Refine ADP for newly placed solvent. refine_occupancies = False Refine solvent occupancies. k_rep = 0.75 Usual value: 1. Smaller values reduce the distance threshold at which the repulsive force becomes active. lattice_symmetry_max_delta = 5.0 Tolerance used in the determination of the highest lattice symmetry. Can be thought of as angle between lattice vectors that should line up perfectly if the symmetry is ideal. A typical value is 3 degrees. use_lattice_symmetry = True When generating Rfree flags, do so in the asymmetric unit of the highest lattice symmetry. The result is an Rfree set suitable for twin refinement. enabled = False Restrains the dihedral angles to a high-resolution reference structure to reduce overfitting at low resolution. You will need to specify a reference PDB file (in the input list in the main window) to use this option. search_optionsSet of parameters for NCS search procedure. Some of them also used for filtering user-supplied ncs_group. initial_occupancy = 1.0 Occupancy for newly placed ions - if less than 1.0, the occupancy may be refined automatically in future runs of phenix.refine. refine_ion_occupancies = True Toggles refinement of occupancies for newly placed ions. This will only happen if the occupancy refinement strategy is selected. refine_ion_adp = *Auto isotropic anisotropic none B-factor refinement type for newly placed ions. At medium-to-high resolution, anisotropic refinement may be preferrable for the heavier elements. refine_anomalous = True If True and the wavelength is specified, any newly placed ions will have anomalous scattering factors refined. This is unlikely to affect R-factors but should flatten the anomalous LLG map. anom_map_type = *residual simple llg Type of anomalous difference map to use. Default is a residual map, showing only unmodeled scattering. use_phaser = True Toggles the use of Phaser for calculation of f-prime values. aggressive = False Toggles more permissive settings for flagging waters as heavier elements. Not recommended for automated use. min_2fofc_level = 1.8 Minimum water 2mFo-DFc map value. Waters below this cutoff will not be analyzed further. min_2fofc_coordinating = 0.9 Minimum 2mFo-DFc for waters involved in coordination shells. fpp_ratio_min = 0.2 Minimum ratio of refined/theoretical f-double-prime. fpp_ratio_max = 1.1 Maximum ratio of refined/theoretical f-double-prime. add_hydrogens = False Runs phenix.ready_set to add hydrogens prior to refinement.